Experts recommend replacing your toothbrush at least every three months or when the bristles become worn. Finding a new toothbrush can be quite a chore, however. Drug stores have rows after rows of different types of toothbrushes, and locating the best one for your needs can be confusing at best. 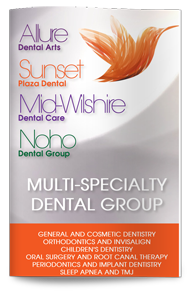 Our dentist in West Hollywood explains what you need to look for in a new toothbrush. Soft-bristled toothbrushes are ideal for removing plaque without irritating your gums or wearing down your enamel. Look for a soft-bristled brush with a head that can comfortable reach all areas of your mouth. Battery-powered toothbrushes can be easier for many people to use, especially those who have dexterity problems. A powered toothbrush can also be more enjoyable for some people to use, which can encourage more frequent use. The handle, style of bristles and shape of the head are largely matters of personal preference. Look for one that is easy to grip, fits your mouth and can even fit into those hard-to-reach places at the back of your mouth. Note the type of toothbrush you choose so that you can look for the same one in three months when it is time to change your brush again. If you chose an electric brush, you will need to change only the brush head to ensure continued performance. Contact our dental office today to schedule your next appointment or to learn more about how you can take better care of your teeth.